The Pope's four-day UK visit in 2010 cost taxpayers at least £6.9m before security, the Foreign Office says. The government paid a further £6.3m - to be reimbursed by the Catholic Church - and the Church paid another £3.8m directly. Those figures do not include policing costs. The Scottish government funded part of the trip north of the border. Foreign office minister Henry Bellingham said the visit was "historic". 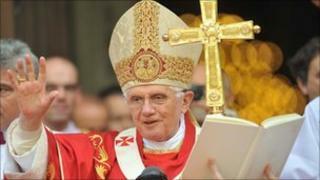 Pope Benedict XVI spent four days in the UK last September, with engagements in Glasgow, London and Birmingham. It was the first-ever state visit by a Pope to the UK, and "an important milestone in the relationship between the UK and the Holy See", Mr Bellingham said. "It was on a far bigger scale than a normal State visit: police estimates suggest that 500,000 people saw the Pope either during events or along the Pope mobile routes. "Approximately 3,000 media representatives were accredited to cover the visit. "The combination of official events, pastoral events, through which the Pope engaged with Britain's Roman Catholics, and meetings with the Church of England and with people of other faiths, made this a visit that was out of the ordinary in every way," he said. Costs included £3m for facilities for the media, £1.7m for a beatification Mass in Birmingham and £483,821 for a service at St Mary's University College in Twickenham. The Foreign Office said policing and local authority costs were "met within existing budgets" but it did not provide a total figure. Matthew Sinclair, director of the TaxPayers' Alliance, said: "While it was legitimate for the Pope to be received as any other head of state would be on a visit, the government do need to do everything they can to restrain the cost of all state visits at a time when the taxpayers who foot the bill are hard pressed."